A delightful gem nestled in the historic Saint-Georges neighborhood, the fully-renovated Hôtel des 3 Poussins welcomes you in a unique setting between Montmartre and Opéra. Whether you are in Paris for entertainment, sightseeing, business, or shopping, you will appreciate the closeness of the major sights and landmarks of Paris as well as the 'village' atmosphere of this friendly, eclectic neighborhood where theaters, cabarets, quaint bistros and tantalizing restaurants are flourishing. Just a few steps from the hotel, you can stroll along the lively Rue des Martyrs and its bustling traditional local shops. In an arty, atmospheric setting where the creative spirit of Montmartre still feels alive, you will discover our 40 rooms decorated with charm and originality. Comfortably furnished in warm, soothing colors, our rooms create a playful setting. Take a break from your busy day to enjoy a cup of tea on our tree-filled patio, or sink into a deep leather armchair in our library-lounge where you will feel right at home. At any moment during your stay, every member of our staff is ready to help you enjoy your time in the City of Light. The 40 completely renovated standard and superior rooms as well as 'Rooms with View' are comfortable, charming havens where you can relax after a day in Paris. Customized interiors feature warm colors, carpet designs reminiscent of winter knits, clever and amusing artwork by a Parisian artist, and modern bathrooms with a retro atmosphere. You will feel very much at home in this cozy and inviting setting designed for your well-being. You will love these quiet, comfortable rooms that look out over a tranquil street or the hotel’s inner courtyard. All rooms are well-equipped: double-glazing windows, flat-screen TV with satellite channels, air-conditioning, LED bedside lamps, free Wi-Fi, bathroom with either a shower or tub, hairdryer, desk, telephone, safe and closet space. - Triples : about 18 sqm. with an ottoman bed suitable for a child or teenager plus a 140 x 200 cm (or 160 x 200 cm) double bed or two 90 x 200 cm twin beds. - Twin : 17 - 18 sqm, with two 90 x 200 twin beds. Separate toilets. Connecting : For families, if booked in advance, we can provide two connecting rooms. - Paris Panorama - Room with Terrace : Triple room of 21 sqm. With a 180 x 200 king bed and an ottoman bed suitable for a child or teenager. The room has a spacious terrace with a stunning 180-degree view overlooking Paris and its monuments. - Toits de Paris - Room with Terrace : Triple room of 19 sqm. With a 160 x 200 cm queen bed and an ottoman bed suitable for a child or teenager. The room has a terrace with a splendid view of the rooftops of Paris. 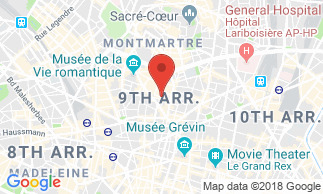 On a quiet street near the Sacré-Cœur, Opéra Garnier, Gare du Nord, and the department store district, the Hotel Des 3 Poussins is located just 100 meters from the Saint-Georges metro station, placing you within minutes of the city’s world-renowned sights. You will appreciate the closeness of the major sights of Paris as well as this friendly, eclectic neighborhood with its numerous theaters, cabarets, quaint bistros and restaurants. Just a few steps from the hotel, you can stroll along the lively Rue des Martyrs and discover its traditional local shops. Public car park 'Renaud' at 30 metres from the hotel, about 35 EUR / 24 hours. It is served in the breakfast room or in your room from 8 am - 10 am. On shiny days, you can breakfast on our tree-filled patio and bask in the sun’s soft morning rays as they sweep over Paris.